Hello Friends! I am on a roll with this June SSS kit! I decided that I wanted to use all of the supplies in the kit, so I wouldn't have to find a place to store them. The kits come packaged in a nifty little box, so they are easy to stack and store, but...space is at a premium in my studio, so if I can get rid of one box, that's a very good thing. 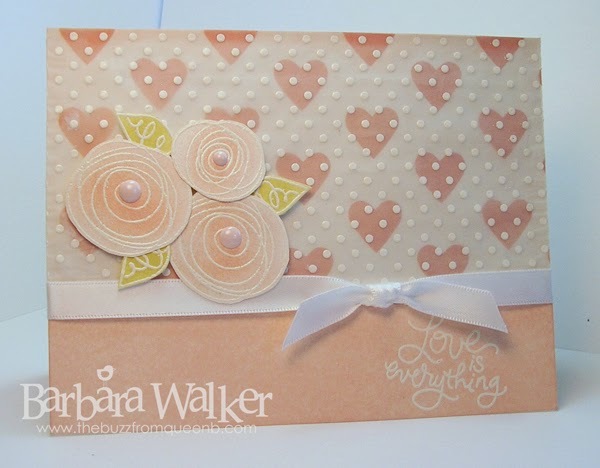 To create the flowers, I stamped the images onto white card stock with Versamark ink and embossed them with white powder. I colored the images using a sponge dauber and ink. Then, I cut them out with scissors. For the card base, I started off by masking the bottom edge of the white card stock and then sponging on ink. After that was dry, I white embossed the sentiment. I layered the dotted vellum over a piece of patterned paper and then adhered that onto my card base. Next, I tied on a bit of ribbon and adhered the flowers and leaves with dimensional adhesive. I added some sparkle onto the blooms with a Clear Wink of Stella glitter brush then added enamel dots to the center of each. Nice and easy, that's my style! Ok...that's all I have to share today. I hope you have a wonderful weekend! Very cute card, I'll certainly try this one out. Thanks for your post. Oh so pretty, Barb! I love every detail, but mainly that peachy color with the white. Love how you created those flowers. I'm so happy you are getting such great use out of the kit you received!